FC Barcelona take on Deportivo La Coruna in Spanish Primera Liga game on Sunday, 17th December 2017 at Camp Nour in what will be a massive league game in the title race. Barcelona can stretch their lead at the top of the table again as Real Madrid are busy playing in FIFA Club World Cup. The match will kickoff at around 20:45 CET / 19:45 uk time and we will have match highlights of the game right here just in case you missed the live action. Match highlights of Barcelona vs Deportivo will be available after the game is over and its massive game which you don’t want to miss barca fan or not. La Liga title race might take a few swings on Sunday with all three in action. Barcelona has started the season relatively poor in terms of their usual form having lost 2 and draw 1 in the opening 7 league games. If they don’t put things together both Madrid clubs might very well run away with the title race. Currently sitting top of the table Atletico and Real Madrid have 15 points each thats 2 ahead of both third placed Sevilla and Barcelona. Since Barca are playing earlier in the day they have a chance to go top of the table and put pressure on both Madrid clubs. Barcelona were humbled by Deportivo La Coruna the last these these two meet back in March 2017. However Barcelona have had the better of Deportivo La Coruna over the last few years. Last time when these two meet was back in October 2016 when Barcelona ran riot scoring 4 past helpless Depotivo defense and we can expect a similar result on Sunday. 21′ 1 – 0 Rafinha openened the scoring in 21st minute after Barcelona had dominated the first quarter of the game. 36′ 2 – 0 Rafinha made it 2-0 for Barcelona scoring his second of the day. 43′ 3 – 0 Luis Suarez got himself on the scoresheet with a nicely taken goal just before the break as Barcelona wrapped up the win. 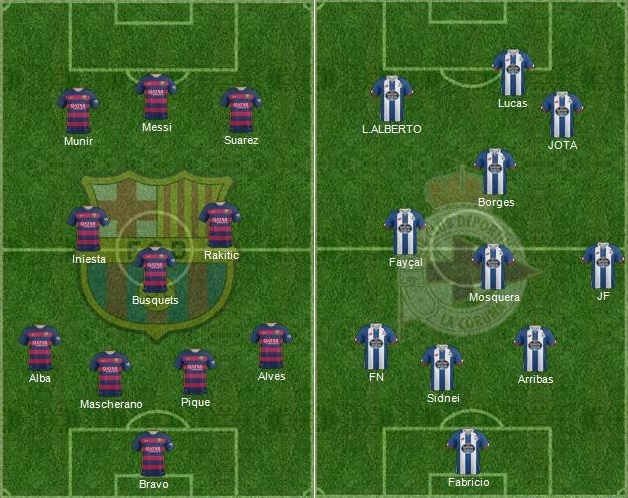 As far as the team news is concern Barcelona don’t have any major injury worries and I full expect Enrique to name his normal full strength side with Neymar, Messi and Suarez starting upfront while Rakitic, Iniesta and Busquest to playing in central roles while the Enrique might have to decide weather to start with Dani Alves or stick with Sergio Roberto. Last time these two meet a 2-2 draw was the result at Estadio Riazor. Luis Enrique side can not afford to drop points like that anymore with both Madrid clubs right up their tails. Predictions: Barcelona are back in the hunt for another treble after eclipsing PSG in historic 6-1 win at Camp Nou and a win against Deportivo will put them in good position in the league heading business end of the season. Neymar and Suarez are back in form while Messi maybe not in top form he is always a threat going forward. I am going with another comfortable 3-1 win for Barcelona in this one.